Welcome to Lenscraft Newsletter February 2016. It’s hard to believe that January has come and gone already. It doesn’t seem like two minutes since I was writing the last Lenscraft News. 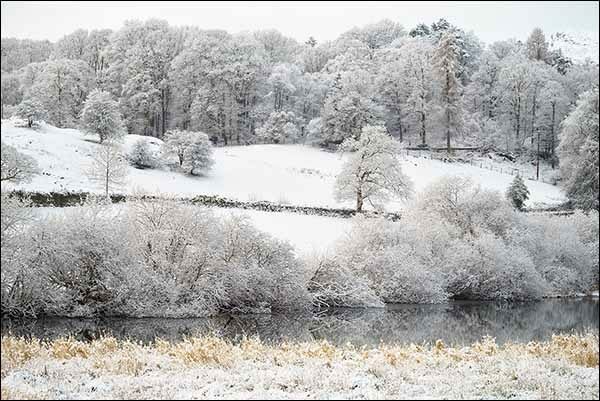 Fortunately, the warm weather has relented and we have seen some snow on the landscape. Despite the speed of time passing, I have managed to complete a few projects you might find valuable. If you have visited the Lenscraft website in the past couple of weeks, you may be aware of the new 30-Day Photo Challenge. The challenge is FREE and designed to improve your photography in just 30 days, along similar lines to my popular book, The Photographers Coach. It involves completing a series of simple exercises, that come to you in a short weekly email. There is also a Flickr Group to support the challenge (more about this in email 5), allowing you to share your work with others as well as see theirs. If this works out, I’m hoping to share some of the photos through Lenscraft News in the future. When new members join Lenscraft they are given the opportunity to sign up to the challenge. But if you joined Lenscraft before mid-January 2016, you will need to sign up using your Lenscraft account profile. Here’s how. Sign in to your Lenscraft account on the Lenscraft website and you will be directed the page titled “Welcome to the Lenscraft Members Area”. You can use the following link to log in. If you are already signed in to Lenscraft you can select “My Account Profile” from the “Members Area” menu. Alternatively, you can go directly to your profile page by selecting the following link. 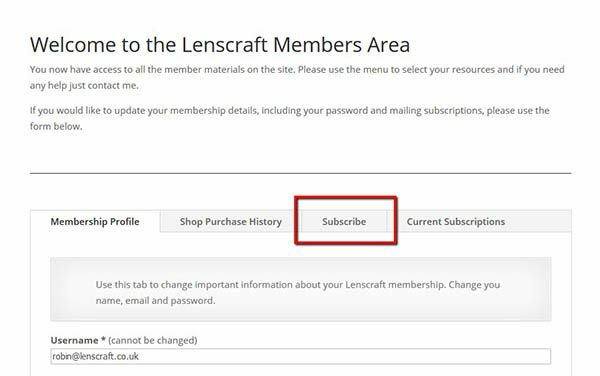 In the page titled “Welcome to the Lenscraft Members Area” click on the “Subscribe” tab as indicated below. In the subscribe tab enter your Email Address, First name and click the option to subscribe to the “30-Day Photo Challenge”. Click the “Subscribe Now” button and the page will reload. You will then receive a welcome email. You can also check which mailing lists you subscribe to using the “Current Subscriptions” tab. If you find you are having problems, you can email me at [email protected]. Describes how to use the Spot Removal Tool in Lightroom to clean up dust spots and damaged areas in your images. This tool has been improved significantly since version 4 of Lightroom. If you haven’t tried it recently, it’s well worth reading the tutorial. Covering some of the tricks you can try to make a blurry photo usable. This also includes a look at the sharpening tools in Lightroom using quite a severe example. If you’re not familiar with Lightroom sharpening, this tutorial provides some helpful guidance. You would be surprised how often I’m asked about this subject. This tutorial explains how it can be achieved in Photoshop. In addition to the tutorials and photo challenge, I have been working on a couple of new guides which I hope to launch soon. Pulling Shadow Details looks at how to transform an image full of heavy shadow into a great shot using Lightroom. As well as detailed instruction you also receive the full resolution RAW file so you can follow every step of the correction process. I hope to launch the guide during February in the Lenscraft Creative Store. From Photos to Art is similar to my other Books and describes the use of the Topaz Texture Effects software. It will follow the usual format with a full explanation of the software and all its features. It will also provide a number of worked examples, helping you put the information to practical use. I hope to launch this book on Amazon during March. P.S. 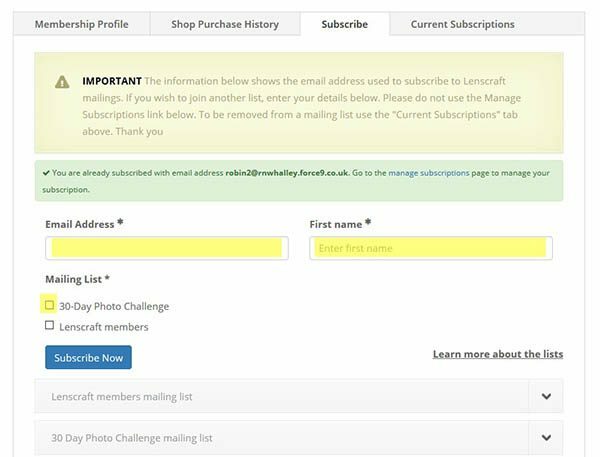 Don't forget that you can also view these emails on the Lenscraft site in the Newsletter Archive.